With the New DryEasy Plus, finally, you can get rid of those wires! When they’re everywhere getting tangled all over your child, wires are just bothersome and really uncomfortable. But is the DryEasy Plus as good as it says it is? 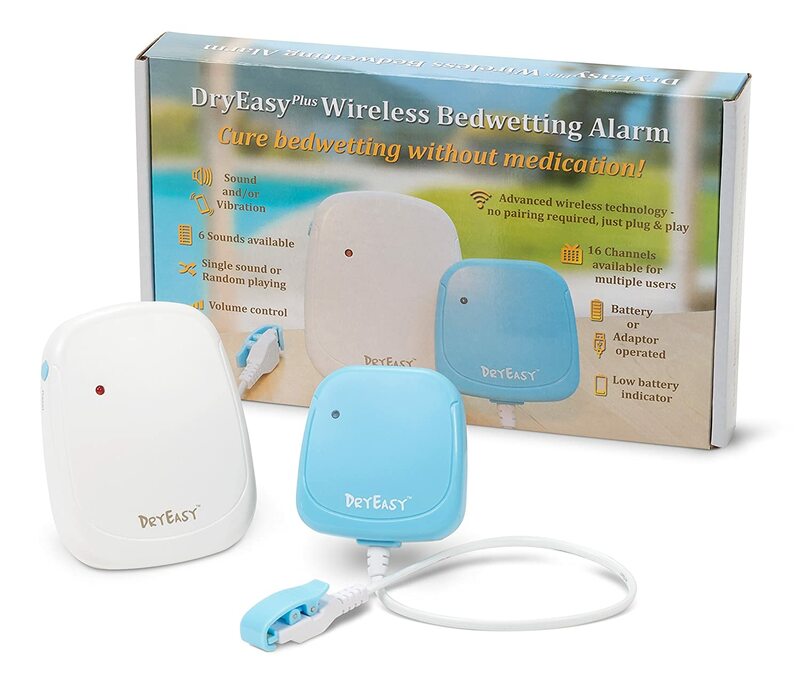 Let’s trust what previous buyers have to say, and in this New DryEasy Plus wireless bedwetting alarm review, we give you this alarm’s pros and cons. Here’s what to expect from this enuresis alarm. It’s a two-piece set, consisting of two color-coded parts – a white receiver and a blue transmitter. 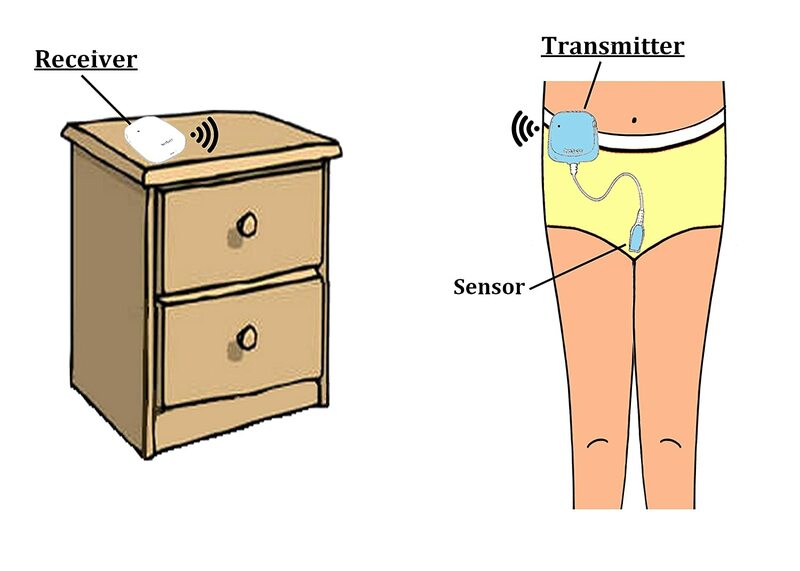 The transmitter has a clip that fastens itself to your child’s underpants. To prevent your child from getting used to a particular sound, the DryEasy Plus comes with 6 different sounds. You can choose a single sound, or you can play all 6 sounds at random. It comes with 4 volume levels. Choose from 3 operation modes: sound only, vibration only, and sound + vibration. It has a low-battery indicator. In this section of this New DryEasy Plus wireless bedwetting alarm review, we give you a summary of what previous consumers / buyers have said about their unit. – Sound. The New DryEasy Plus wireless alarm makes a loud sound that wakes up a deep sleeper. But while it does wake up children so they can go to the bathroom, the sound may scare them as shared by one mom who said her daughter wouldn’t want to use the alarm again. – Wireless. This feature is truly a great advantage. Your child won’t have to make too much effort in making sure every wire is in place. – Clipping It On Underwear. Some parents say their child has had a difficult time with the clip. It can be “tricky” especially for first-time users. That said, it’s best to give your child ample practice sessions before the first night of usage. – Performance. Does it work? The majority are happy about the results. How long did it take their child to finally end their bedwetting problem? Answers vary, but most say it took them a few weeks. The trick is to be consistent. The New DryEasy Plus is a new device that offers an alternative in case your child is “terrified” with the sound of another alarm (e.g., Malem), or if the previous one just didn’t work because of the long cord. Note that results will definitely vary from one child to another, and consistency is key.